He wasn’t washing his car or riding a motorcycle. Instead, it was a pickup basketball game that slayed Zack Greinke this offseason. Aaron Boone sends his condolences. Now that Greinke has a fractured rib and will open the season on the injured list, what does that news mean for his prospects in fantasy baseball circles? The first instinct is to take the team’s prognostications – that Greinke will miss only two-to-three starts – and say the whole thing is not a big deal. Just a few starts less from the ace, so you could drop him a couple points in the rankings and maybe pounce on him if he falls further than his third-round ADP (42.7 by the Bloomberg Sports Front Office tool). Then again, even just three starts is a tenth of a pitcher’s season. Should he miss five starts – the likely situation if he misses the first month – he’ll miss a full sixth of his season. Take away a sixth of his Bloomberg Sports projection, and you get 166 innings with 11 wins and 157 strikeouts. Sure, he is still projected for a 3.46 ERA and 1.17 WHIP, but the whole package is just a little less valuable because of the lower innings projection. A rosier projection – that he misses three starts – moves him from about the fifth-best at his position to about the 10th-best. Take another two starts away, and he’ll slide down somewhere between 15th and 20th on the list. But there might be reason to drop him a little further even. The rib cage is a tricky place for an injury in baseball. A pitcher’s motion is tantamount to his success, and pain in the ribs will keep him from completing his motion as he’d like. Phil Hughes fractured a rib and missed 136 days. We saw what happened to Jacoby Ellsbury last year. We aren’t doctors here, but we also know that we’ve seen players recently miss extended time with the same injury. That means there’s a risk that he puts in fewer than 166 innings, and a risk he he won’t even be a top-25 pitcher this year. We know that Greinke will drop in drafts now. We know that he deserves to drop some, and that there’s risk that he should drop even further than he will. The tricky part is knowing when exactly to pick him up. Use conservative projections for his output this season, though, and you’ll probably find the right time. At least it wasn’t an elbow! The 2010 nightmare of Trevor Hoffman was not enough to scare off the Milwaukee Brewers from signing another 40-year-old reliever this off-season – this time Takashi Saito. In terms of performance, Saito is a much safer signing, since the righty has a more recent track record of success than Hoffman did, having been one of the best relief pitchers since coming to the United States in 2006. After spending three seasons with the Los Angeles Dodgers (much of it as a closer) Saito has spent the past two seasons as a set-up man in Boston and then Atlanta. Regardless of his role, he has been dominant over those five seasons. In fact, he is just one of six relievers in baseball to throw at least 250 innings with an ERA below 2.25 since 2006. You may recognize the other names on that list: Joakim Soria, Mariano Rivera, Joe Nathan, and the two men he has set up for recently: Jonathan Papelbon and Billy Wagner.Of those names, only Saito and Wagner have done so with a strikeout rate of 11.0 or greater per nine innings. Saito features a fastball, slider, and a curveball. He induces more swings and misses than league average with all three pitches, fueling his fantastic strikeout rate. He has also excelled at limiting walks and home runs allowed. The one negative on Takashi Saito is health. Although he has pitched at least 45 games and topped 47 innings in each of his five seasons, he has dealt with a variety of ailments, including several arm issues. As he advances in age, those concerns will not go away; however, he did throw a respectable 99.2 innings over the past two years. Saito won’t have the closer job to start, which severely limits his fantasy value in standard mixed leagues, even with his strong ratios. That said, if something should happen to incumbent closer John Axford, be it injury or ineffectiveness, Saito is the most likely replacement for saves. Because of his fantastic peripheral stats, low ERA, and status as the Brewers’ plan B, Saito is still worth either a reserve-round pick in standard 12-team mixed leagues, and a slightly higher draft slot in deeper mixed and NL-only leagues. If your league counts holds, Saito’s value rises considerably. with the Cincinnati Reds is a nice touch as well. all, leaving his ability to cause havoc on the basepaths untapped. Meanwhile, Escobar struggled in his first full season in the bigs. For more on Brewers hitters, check out Bloomberg Sports’ Fantasy Tools. Axford will begin the 2011 season as the Brewers’ closer. That’s the only thing in the 27-year-old’s career that seems like a given, as he’s had one heck of a ride to this point. A former Yankee farmhand with a handlebar mustache, Axford had seven Major League appearances before appearing in 50 games last season and saving 24 games with a 2.48 ERA. A devastating strikeout rate (11.79 K/9 innings) points to a closer with staying power, even if his walk rate (4.19 BB/9 IP) is a bit worrisome and his flukishly low home run rate’s likely to edge higher next year. Hoffman managed to break the 600 career saves mark in 2010, which represents a high point in his season. Otherwise, 50 appearances and 31 earned runs suggests the man who made “Hells Bells” a ballpark anthem is near the end of his career. Give Wolf some credit, as he was able to squeak out one more inning in 2010 than he did in 2009, despite making 34 starts both years. Unfortunately, for Wolf and the Brewers, his ERA shot up nearly a full run, and his peripherals suggest he just didn’t pitch as well as that 4.17 figure might suggest. The National League Central is not a good division and Wolf’s history suggests he should bounce back in 2011. The problem being, of course, folks will overvalue his 2010 performance based on the ERA, innings, and wins. Let someone else overbid. 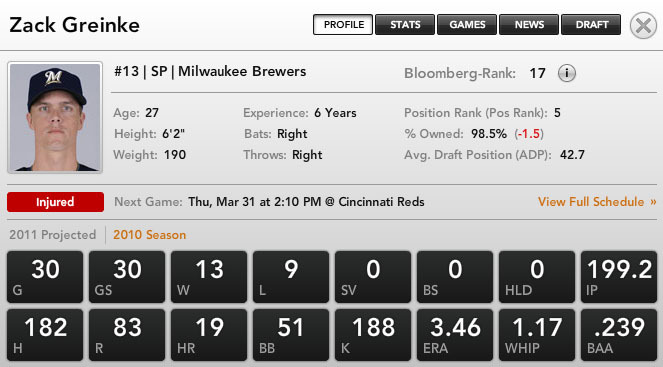 For more on Brewers pitchers, check out Bloomberg Sports’ Fantasy Tools.